I noticed all my birds were gone from the feeder this morning. When I went out I found this poor boy. He was a juvenile, one of two young ones that were raised here this summer. It was probably the hawk..or the cat, now we even have an immature bald eagle that's been circling around, I saw him today...Wow! 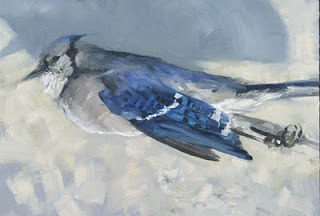 Anyway I thought I'd do a study since the blue jay was in pristine condition. Number 11 in my series of dead bird paintings. I like this painting. The colors are great. We had a dead bird, I think a finch, probably the dogs, or maybe just got sick.